Armchair Fiction presents extra large editions of classic science fiction double novels. 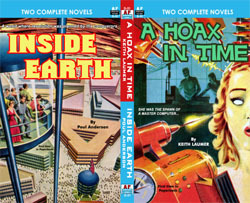 The first novel, “A Hoax in Time,” is a tale about an ultimate computer and perhaps the ultimate hero, who combine in this rambunctious science fiction romp to perpetrate, simultaneously, a superb comic opera on the one hand, and on the other an insightful and satiric comment on the world we all live in. Appropriately enough, the link that unifies grand farce and thought-provoking philosophy is the Internal Revenue Service—without whose greedy hands this story could never have been written. The second novel, “Inside Earth,” is great futuristic drama by sci-fi master, Poul Anderson. It is a tale of interplanetary rebellion. Obviously no conqueror wants his subjects to revolt against his rule. Obviously? This one would go to any lengths to start a rebellion! When Halgan Conru was sent to Earth by the Empire, it was with the express purpose of helping to generate a successful revolution against his own people. Little did he know that the strength and charms of a lonely Earth woman would soon test his loyalty. Poul Anderson is one of the most beloved science fiction authors of all time. Here is another fine example of his story-telling prowess.